There may be no more greater literary sin than intentionally falsifying the sequence in which events occur in order to pass off lies as truth in the eyes and minds of the readers. 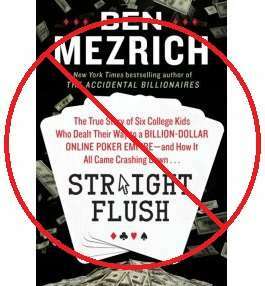 It’s an abomination of a practice, and in Straight Flush, the new “true story” as penned by Ben Mezrich of the rise and fall of online-poker site Absolute Poker, it’s been carried to the extreme. What’s even more sad is that this isn’t the first time Mezrich has resorted to this basest level of literary chicanery; such problems in understanding and communicating the basic flow of time have bedeviled Mezrich’s fanciful works ever since his first, famed effort, Bringing Down the House. Let’s get right to the facts regarding the construction of Straight Flush, so that the readers here are left with no doubt as to who isn’t telling the truth. Straight Flush‘s internal chronology as laid out by Mezrich starts with the surrender of Brent Beckley to United States authorities, which occurred in December of 2011. The remainder of the book is a single, continuous flashback, starting with the gathering of the University of Montana SAE fratboys in September, 1997, and moving through 15 years of Absolute Poker psuedo-history, culminating with a “where they are now” epilogue describing the current status of the six primary fratboys at the time of the book’s publication. Except for the part, that is, where all the cheating takes part at Absolute Poker and millions of dollars were taken from the site’s players. Mezrich can’t tell that story as it happened, because doing so renders bare the excuses and alibis of primary cheat and Straight Flush protagonist Scott Tom as the flimsy constructs they really are. (A) — pp. 247-250: A lengthy retelling of the first rumors of insider cheating at Absolute Poker, as recounted by Pete Barovich, one of the six primary SAE fratboys. In this passage, Barovich asserts that he took primary responsibility for attempting to cover up the initial allegations, in part issuing a bogus press release claiming that those allegations had been investigated (they weren’t), but were unfounded. (B) — p. 251: First mention of the infamous “POTRIPPER” tournament on AP, involving the perhaps-accidental e-mailing of an internal hand-history spreadsheet to that tournament’s runner-up, Marco “CrazyMarco” Johnson. (C) — p. 252: An acknowledgement that the spreadsheet sent to Johnson did contain evidence of cheating, including the presence of incriminating data involving two accounts linked directly to Scott Tom. (D) — p. 253-257: In the following chapter, Mezrich serves up a lengthy, five-page, reconstructed discussion between Scott Tom, Barovich and others regarding the implications of the discovered cheating, along with the proffered claims that it was done by a forever-unnamed Costa Rican employee of AP using a software door erroneously left open by the site’s South Korean programmers. The noble Barovich even talks about how the scandal is “gonna be on goddamn 60 Minutes,” a whole-cloth reconstruction; it wasn’t even on that show’s radar at the time, and when 60M did an online-poker story, it focused mostly on the other cheating scandal over at UltimateBet, which didn’t even become public knowledge for another four months. We won’t even dig deeply into the hilarious supposition that old test accounts were lying around with large amounts of real money within them, as the fratboys and Mezrich try to pass off on p. 254. That’s ridiculous, an obscene lie by itself. Like the old saying goes, it takes money to make money, even illegally, and there were thousands of real dollars in the chipstacks of the players at the tables where the cash-game cheating occurred. (E) P. 257: The tale of the crashed Sabreliner jet at Costa Rica’s Juan Santamaria Airport begins. The private, rented jet skidded off the runway and into the grass, causing some bumps and bruises but no significant injuries. The four passengers — Scott Tom and his live-in, pregnant girlfriend, and Hilt Tatum and wife — were off to the Caribbean Islands for a week-plus vacation. (A) September 17th and 18th, 2007. Barovich actually issued not one bogus and unofficial press release, but two, via his second-in-command, Danielle Burrows. Barovich and Burrows headed up Chipleader, the internal division of Absolute Poker that ran the site’s far-flung affiliate network through which new online players were recruited to sign up to the site. The first release, the baldest and most blatant denial, was quickly pulled from the affiliate sites where it first appeared, only to be restored later when the cheating became irrefutable. The second statement took its place, and here’s a link to a small poker-site story that correctly reported it at the time. (B) September 12th, 2007, and October 14-16, 2007. Two separate dates apply, and here’s why: The actual Absolute Poker tournament in which “POTRIPPER” (Scott Tom) cheated Marco Johnson and other AP players took place on September 12th, but it was several more weeks until the obvious cheating that occurred was proven out. Johnson complained immediately, and was sent a massive hand-history spreadsheet in response, even as the SAE fratboys scrambled to cover up the blatant cheating that occurred. What the founders didn’t know was that the spreadsheet was different than most hand histories sent out to players; what Johnson was sent was an Excel spreadsheet file with so many lines of data it overflowed the size restrictions of Excel as it existed in 2007. Johnson was so befuddled by what he received that he set it aside until early October, only to send it out to people including Steve O’Dwyer — the same “@steveodwyer” currently lambasting Mezrich on Twitter — Nat Arem, and others. Arem in turn sent that on to a small number of industry writers who were monitoring the story, including yours truly and Gary Wise. The key breakthroughs regarding the spreadsheet Johnson received came in the overnight hours of October 16, 2007, and I was a part of that chat-based effort, which was being led by Arem and stretched over several days. This isn’t hearsay of any sort; I had a small role in it and first recognized that the infamous “rivieraltd.com” domain might have significance. 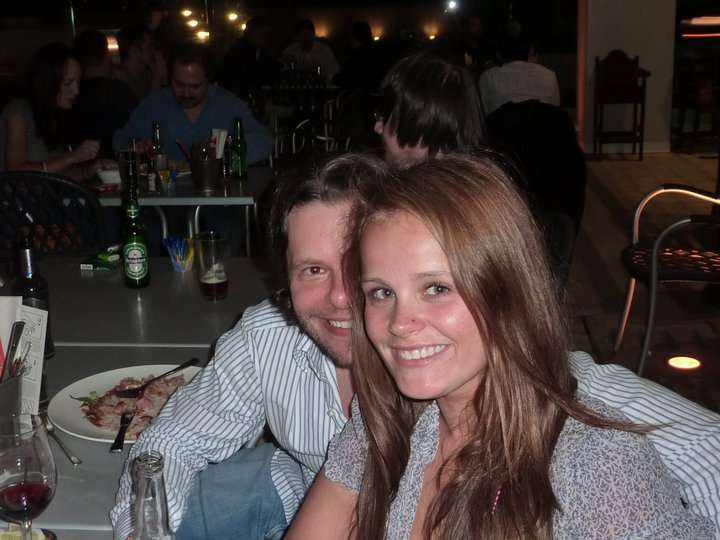 (C) October 16th, 2007, and no other date. As recounted last time out, an unidentified Absolute Poker executive changed domain-registration information connected to rivieraltd.com within minutes of Nat Arem posting its discovery on 2+2 and PocketFives, two large poker-discussion forums. At this time, the coverup by AP was ongoing and immediate. (D) Unknown, but after the above. Mezrich’s five-page dissertation on Scott Tom’s nobility offers no new facts that can be tied to a specific date. It does reference A, B and C, however, and amounts to an imaginary resolution to the cheating problem, which romantically involves Scott Tom departing his dear creation, and flying off into the sunrise (since it was to the east), to a hoped-for happy ending. So it can’t be before any of the other three. (E) September 3, 2007. Yes, Scott Tom was so pure in his motives for exiting AP that he managed to travel at least seven weeks into the past to depart. The Sabreline skidding off the Juan Santamaria runway happened before the cheating in the POTRIPPER tournament, before the discovery of the connections to Scott Tom, before Absolute Poker was finally forced to admit that the cheating occurred. It was a cause, not a result. Here’s a link to a very official report that confirms when it happened, though dozens of similar reports on the accident litter the internet to this day. As with all the other evidence presented to date, these facts are simply not debatable. Nor is this: Ben Mezrich is a gross literary liar. His glossing over of the AP cheating scandal was bad enough, but in falsifying the timeline to do so, the entire second half of Straight Flush has been rendered null and void. Whether or not Mezrich was paid extra to lie on behalf of the Absolute Poker fratboys, accepting a healthy commission to take on the project over and above his standard book deal, is something that remains unknown for now… despite what Occam’s Razor might suggest. We shouldn’t have to wait too many years to find out. Behind the poker-world scenes, Scott Tom is known to have “diarrhea of the mouth” when he drinks — he can’t shut up, nor has he ever stopped drinking. Whatever the exact nature of the Mezrich/SAE fratboy deal, that’ll eventually come out as well.